The Beeston is a great and popular choice for either front or back door and is the most common option for a stable door. Given the size of the glazed area, it’s possible to create something particularly individual when combined with one of the major colours, or you can even specify an integral blind. Like all the doors in the Solidor range, there’s the option of chrome, brushed, gold, black chrome, black and white door furniture. So go on be bold in your design! A premium glazing system, where fashion and function were viewed as being equally important. No screw hole plugs – Clean design on both outer and cover frames with classic crown molding and a handcrafted appeal. 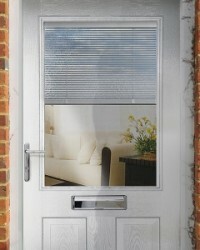 All of our glazing cassettes can re-glazed if required.